A dark, old-neighborhood, mobster movie with some creative twists as low level street guys have to deal with the new boss. State Of Grace is a movie about the people who once lived in hell’s kitchen, New York, right about the time when it stopped being called that. These are guys who grew up there, doing petty crimes and working their way up the ladder. 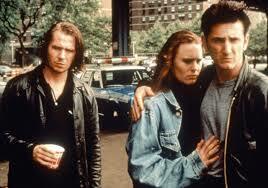 Sean Penn plays terry Noonan. A cop who returns to the old neighborhood to go undercover and see what he can find out about his old friends. We’ve seen movies like this before, only this one’s better than most. That’s in large part due to the all-star cast, which includes Ed Harris as the serious boss, Gary Oldman as the loose cannon brother to the boss (and if anyone knows how to play a loose cannon, it’s Gary Oldman. just see the professional), and Robin Wright as the love interest. She’s more than just a romantic character, however, because she’s connected to the mafia scheme too. Her brothers are frank (Ed Harris) and Jackie (Oldman). With them on one side and terry as the cop on the other, all of this puts her right in the middle. The movie starts with a somewhat confusing situation where there is a staged drug deal gone wrong and Noonan ends up shooting the two guys he was making the deal with. Apparently it was all for the benefit of the guy he was there with, to give Noonan some credibility, but the situation isn’t explained until much later in the movie. It really doesn’t come up again until the second half, when we see John Torture at a funeral. Ted. Later on, terry explains it all to Kathleen (Robin Wright), saying that the whole thing was staged, the dealers were really cops, and when he shot them he used blanks. This whole thing was really just to establish terry Noonan’s credibility with us, as well as to start the movie off with something exciting. It gets significantly slower after that. Terry comes back into the old neighborhood, hells kitchen. The new name for the area is Clinton and the characters comment on how ridiculous that sounds. Terry takes up with his old best friend, Jackie, and together they go across the water to New Jersey to see the new boss, Frankie Flannery (Harris). In many ways, this movie reminds me of the Sylvester Stallone movie Cop Land from the mid-nineties. That movie, made seven years after this one, also featured an all star cast of low level guys with ties to the mob who kicked up to bigger bosses. Those guys also worked in Manhattan, but lived across the river in New Jersey. They also all grew up together, and had stories upon stories about each other from the old days. And that movie also featured characters from this neighborhood, which now served on both sides of the law. 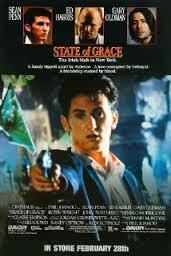 Stallone was the cop and Harvey Keitel was the big boss with most of the town working for him. Keitel was very similar to Ed Harris here, in state of grace, with his serious attitude about running things, but also deep down still wanting to be one of the boys. Cop land is a better movie than state of grace, because it took the elements of this movie that worked and added to them. There’s even a wild card loose cannon character in that movie, Superboy, played by Michael Rappaport, who is a blood relation to the big boss and has to be killed because of his antics that are just no good for business. But State Of Grace has other things going for it that Cop Land does not. For one thing, the romantic angle between Terry and Kathleen is all the more meaningful here (than say Stallone and Annabelle Sciorra), because the men Noonan is after are her brothers. And when he tells her that he’s a cop, long before he’s ready to come out to them, she has to decide what to do about it. Does she choose Noonan or choose her brothers? It’s a pretty big risk either way. The first quarter or so of state of grace is pretty slow and all about establishing the characters. It establishes Stevie (John C. Reilly), as another local kid, loose cannon, who owes money, disrespects the higher ups, and can’t be trusted. Frankie’s crew takes Stevie along on jobs, but it’s only a matter of time until the word comes down from the higher ups that this guy needs to be killed. And once Stevie is taken outside and executed, the movie suddenly picks up. Now both terry and Jackie seem to become alive, both of them enraged that someone would come into their neighborhood and kill their friend. They each handle the situation differently, with Jackie assuming he knows who did it and making plans to go after and kill him, whereas terry wants to investigate and ask questions about that night until he knows the truth. Soon Jackie is taking matters into his own hands and retaliating for his friend. Frankie is called in to meet with the big boss about what his younger brother did, and it’s a very tense nail biter of a scene with his men staged in a loft down the street, waiting for his call. The plan is that if he doesn’t call them by a certain time, they can assume he’s been whacked and bust in to the restaurant spraying bullets. So it’s all about this call, and Frankie is sitting at the table, talking to the big boss, looking at his watch, and realizing he’s in a pretty bad situation. If he doesn’t get to that phone fast, his boys are going to bust in any second. This might be one of the better scenes of the movie, but there are plenty of others like it. There’s a meeting on the docks, for example, where terry accidentally gives his fellow officers the wrong address. And then another scene where terry and Jackie have to sprint through a burning house. The tension builds throughout this movie and gets more and more exciting. It does take a little while to get going, from the start of the film, but once it does, it becomes like a sleeping giant, wide awake and ready for action. The stellar actors involved really help elevate this material as a low-level gangster movie done right.